This Is the Hottest Kiss Ever Photographed, Right? 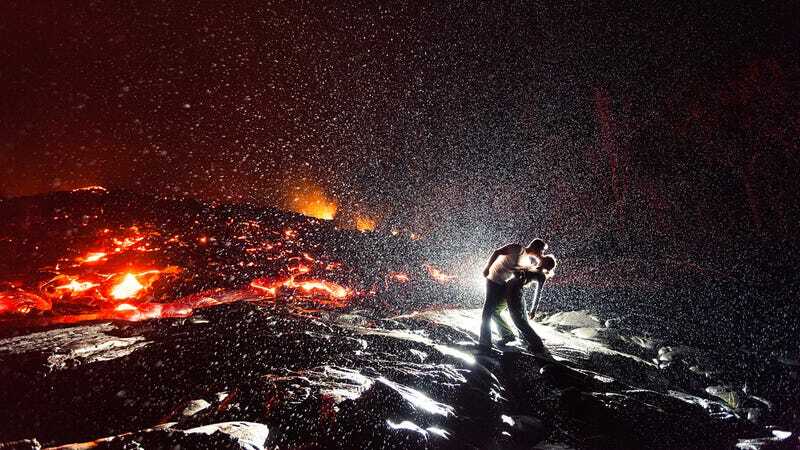 Photographer Dallas Nagata White and her husband were visiting the Kilauea lava flow in Hawaii when it started to rain. They decided to take some back-lit photos using her DSLR, a tripod, and a wireless flash system, ending with what I think is the hottest kiss ever photographed. My husband and I, along with a tour guide and a group of friends, hiked up to what was formerly the Royal Gardens subdivision above Kalapana, Hawaii, where the last standing house was just recently taken over by the active lava flow. While waiting for the rain to pass, we started taking back-lit portraits of each other in front of the lava flow after I set up my camera on the tripod. For the last photo, my husband spontaneously dipped me in a kiss. It was a truly once-in-a-lifetime moment! I framed the shot and pre-focused the lens, instructed one of our friends to press the shutter while another friend held the speedlite behind us. We took a couple photos just standing before my husband said, "Just one more!" and dipped me with a kiss. Posting a screenshot of my Lava Kiss photo before and after in Lightroom if anyone is curious. I imported my CR2 RAW files as DNG, as seen by having my mouse over the file below. The file to the left of it is the .PSD file generated by opening it in Photoshop so I could resize and sharpen it manually. You can also see the other photos in the film strip - those haven't been edited yet at all, but I'll get to those eventually. As you can see, all I did was bring out more color and detail in the shadows, and warmed the highlights a bit. So yeah...no fancy Photoshop compositing, just a wireless flash system, helpful friends, rain, lava, and Lightroom.